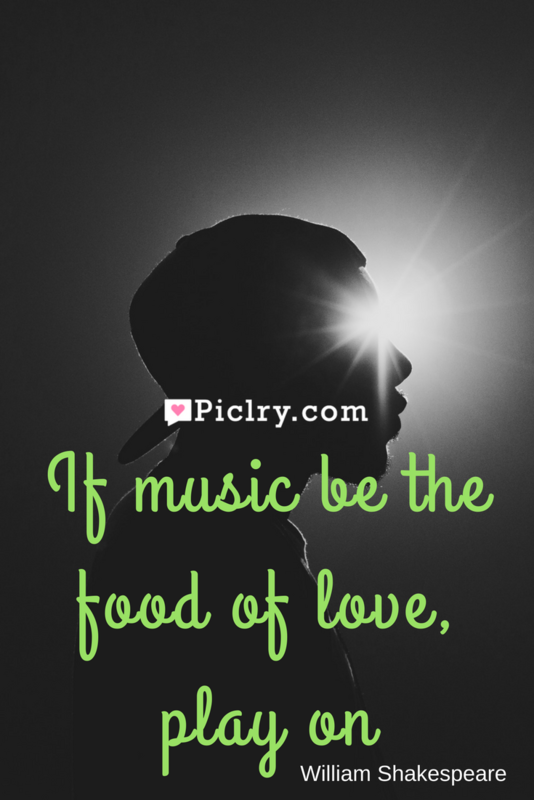 Meaning of If music be the food of love, play on Quote by William Shakespeare. This is a proverb picked from ‘The Twelfth Night’ by Shakespeare. In the section Duke Orsino, who is in love with Olivia, is hurt because she doesn’t reflect his feelings. He is on the brink of suffering emotionally. He says that if music is the food of love then he wants it more, so much, that he gets disgusted with it. Very much like eating too much food kills the appetite. Like food makes the body grow and nourishes it, music makes love grow and flourish. He is saying that if he keeps listening to the romantic melancholy music and gets enough of it, he might just get disgusted with the music and metaphorically becomes disgusted with Olivia. He will be beyond satiated; he will be surfeited and then will not desire Olivia so ardently like he does now. So, if music be the food of love, play on. I love riding motorcycles, wrestling alligators, catching diamondback rattlesnakes.